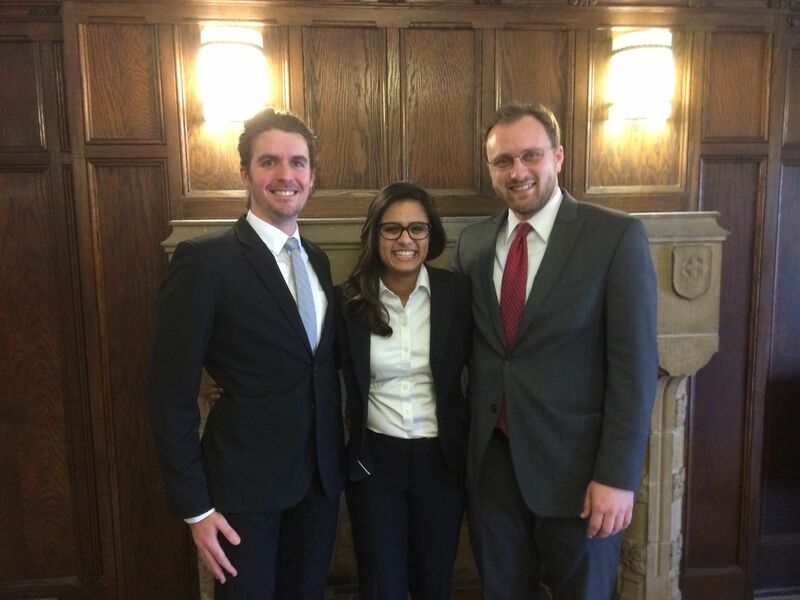 Students Trevor Maxwell (2L), Chris Keeler (2L), and Asma Kadri (2L) won the International Criminal Court (ICC) Moot Competition, hosted by Pace Law School. The AUWCL team was one of 15 teams who participated in the competition. Keeler also placed in several categories, taking home first place for best oralist in the final round, third place for best oralist overall, and second place for best prosecution brief. The team will compete in the international phase of the ICC Moot Court Competition, held in The Hague this May. The students were coached by the War Crimes Research Office's Chante Lasco, Katherine Cleary, and Professor Susana SaCouto. The team will now go on to compete in the international phase of the ICC Moot Court Competition, which will be held in The Hague in May.